A versatile single breasted jacket, neatly tailored and finished with decorated cuffs, functional pockets and polished chrome buttons. Wear with a shirt and tie for day events or add a 5 button waistcoat and bow tie for more formal functions. 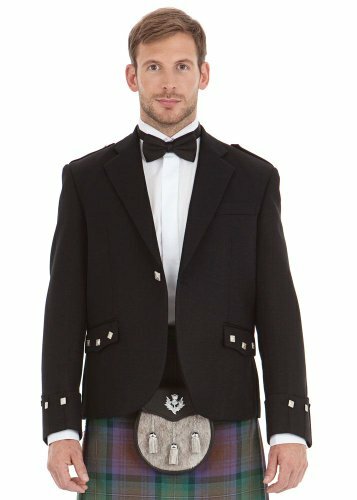 If you have any questions about this product by Kilt Society, contact us by completing and submitting the form below. If you are looking for a specif part number, please include it with your message. Mens Mackenzie Modern Tartan 7 Piece Casual Kilt Outfit Size: 42" - 44"
Mens Royal Stewart Tartan 7 Piece Casual Kilt Outfit Size: 30" - 32"
Mens Royal Stewart Tartan 7 Piece Casual Kilt Outfit Size: 42" - 44"
Mens Macdonald Modern Tartan 7 Piece Casual Kilt Outfit Size: 30" - 32"
Mens Macdonald Modern Tartan 7 Piece Casual Kilt Outfit Size: 38" - 42"
Kilt Society Mens 7 Piece Full Dress Kilt Outfit- Black Watch Tartan with Black Hose 30" to 34"
Kilt Society Mens 7 Piece Semi Dress Kilt Outfit- Gunn Tartan with White Hose 30" to 34"
Kilt Society Mens 7 Piece Full Dress Kilt Outfit- Gunn Tartan with Black Hose 46" to 50"
Kilt Society Mens 7 Piece Casual Kilt Outfit- Gunn Tartan with White Hose 46" to 50"